Removal of hexavalent chrome and other heavy metals - GlobeCore. Oil Purification Systems. The nature of the vortex layer used for treatment of waste water containing hexavalent chrome and other heavy metals allows to radically reduce reagent consumption, achieves a more complete purification and makes the process continuous. Ferromagnetic elements in the active zone of the AVS device, in the electromagnetic field, intensively mix the reagents entering the active zone. 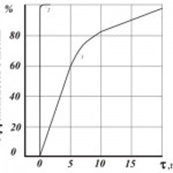 The shock and friction causes pulverization to colloid degree of dispersion. The colloid metal is a good reduction agent. Simultaneously with the formation of colloid metal in the process of ferromagnetic element dispersion, the electrolysis of water in the vortex layer generates hydrogen. 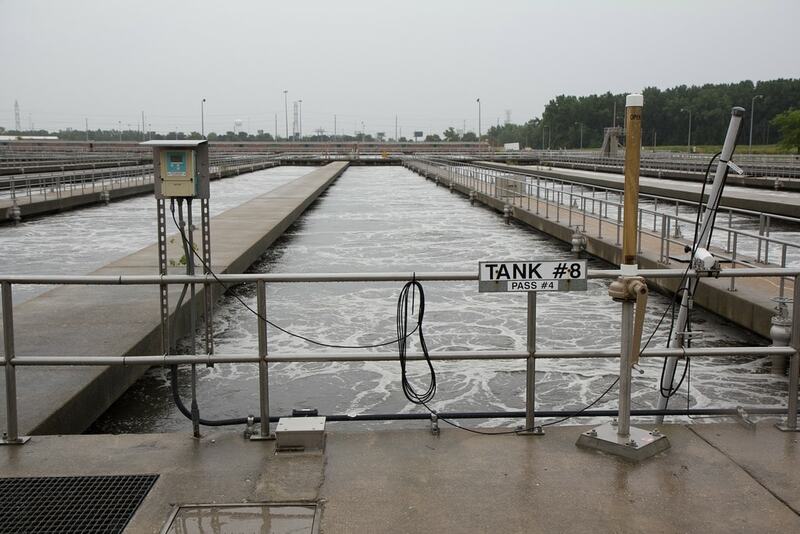 Both factors play a significant part in reduction of hexavalent chrome and other heavy metals in the waste water. This capability of the vortex layer significantly reduces the consumption of ferric sulfate for reduction of hexavalent chrome, and even achieve complete reduction of hexavalent chrome and other metals in the waste water due to just the colloid metal and the emitted hydrogen. The reduction reaction in the AVS takes fractions of a second, making it possible to run the process continuously at a high rate. 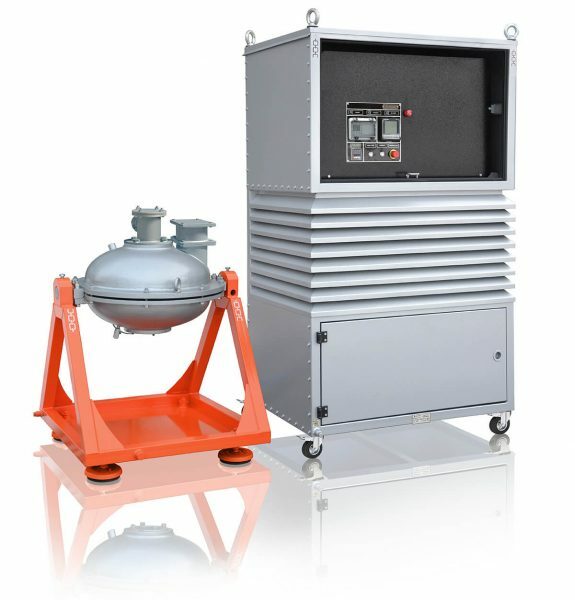 The intensive mixing of the reagents and the influence of the electromagnetic fields, as well as dispersion of the compounds leads to better dispersion of the metal hydroxides, than that in mechanical mixing devices. Curiously, increase of sediment dispersion does not slow its setting. On the contrary, sedimentation of solid phase particles in the AVS occurs 1.5 – 2 times faster than in a mechanical mixing device. 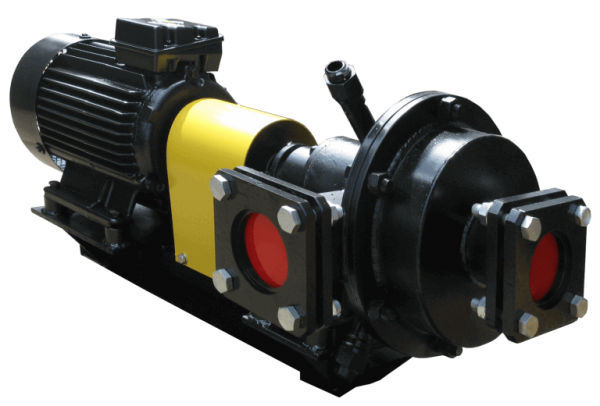 This is due to the intensive magnetic influence on the suspension changing the interfacial tension on the coundary between the liquid and the solid particle. A most important property of the vortex layer is the fact that the physical and chemical properties of a substance changes after processing, significantly changing the chemical activity of the product. 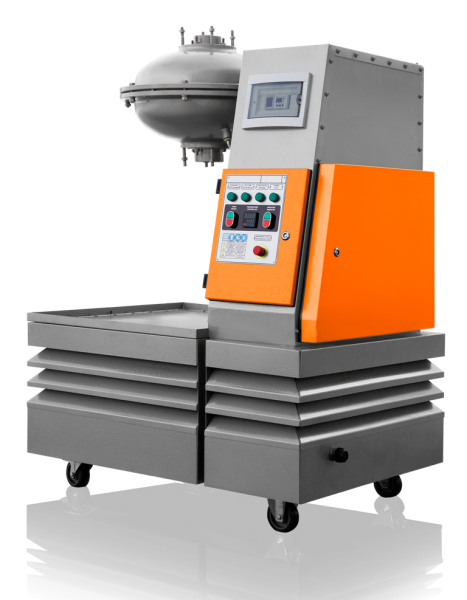 Using a mechanical mixer device involves equipment with large footprint and significant capital investment. The duration of the cyclic purification process in this method is 30 to 120 minutes. Using the AVS for purification of waste water from chrome by using chemical reduction in alkaline environment with simultaneous settling of chrome and other metals in the form of hydroxides only requires vessels for ferrous sulfate and lime milk with portioning devices, one AVS device and a filter or a sludge collector. The results of testing the vortex layer device for decontamination of chrome-containing waste water are as follows. Simultaneously, industrial purification using mechanical agitation and bubble aeration was performed. Consumption of lime milk in the process was 115 — 120% of stoichiometric amount. Duration of mixing the waste water with the reagent was 15-20 minutes. Figures 1-3 show comparative dependencies heavy metal removal efficient and clarification of waste water in settling tanks using AVS and mechanical mixers. To compare efficiency of removing chrome from waste water in industrial conditions, chrome was reduced in a regular reagent process in a reactor with bubble aeration, treatment duration was 15-25 minutes. Figure 3 shows the comparative data of this test. 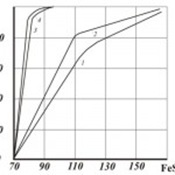 The results of industrial use of the AVS in facilities purifying chrome containing waste water, both in acidic and alkaline environment, indicate that the AVS based process offers better purification qualities (below the maximum allowable level of contamination) removing chrome and heavy metals (Fe, Ni , Zn, Cu, Cd), while using 90-100% reagents of stoichiometric amount and significant simplification of purification facilities and their operation, as confirmed by the results of experimental research and the efficiency of the ferromagnetic element vortex layer in the AVS. 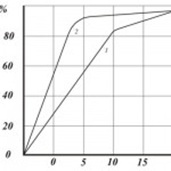 In the regular reagent process, the consumption of reagents is: 115-120% of precipitation agent (Ca(OH)2, Na2CO3) and 150-175% of reduction agent (FeSO4). Based on the experiments and the industrial testing of the AVS in the waste water purification process, new processes were offered and implemented in purification facilities of various industrial sites (Fig. 4, 5). 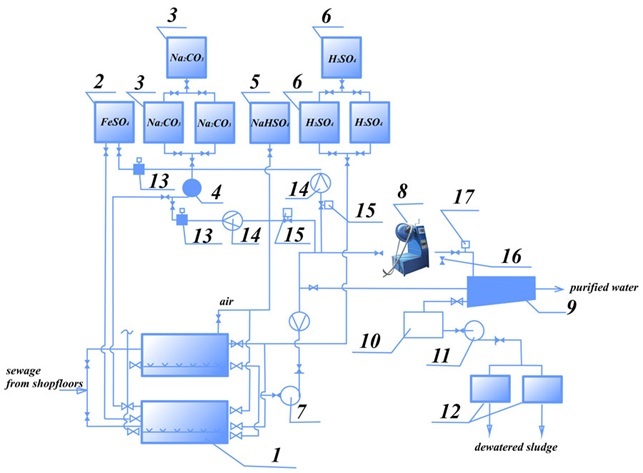 Figure 4 shows the process diagram of simultaneous purification of chrome-containing and acidic/alkaline waste water, the essence being that the waste water from two sections of the facility flow into two mixing vessels in turns. When one of the tanks is full and the water is averaged, acid is added to bring pH to 2-3, along with reduction agent (sodium bisulphate). After mixing for 5-10 minutes, the water flows to the AVS. Alkali (Na2CO3) is added to the flow to bring рН to 7.5-9. In the AVS the waste water is processed with the reagents for several seconds, completing the reduction of Cr6+ to Cr3+ and formation of Cr3+ and other heavy metal hydroxides. A possible reduction agent is ferrous sulfate (FeSO4). Using vortex layer devices in this process improves the purification to the point where contamination is below the maximum allowable limits, reduce reagent us by 1.5-2 times, half the energy costs and reduce purification facility footprint by 10 – 15%. Simultaneous purification of waste water after mixing decontaminated chrome and cyan containing water with alkaline/acidic water. To removal of salts from the purified waste, a gravel-sand filter, cation and anion exchange filters are used, from which the water goes to clean water tank and back into the process. This method of waste water purification if the most economical, opening wide possibilities of its use in various industries.